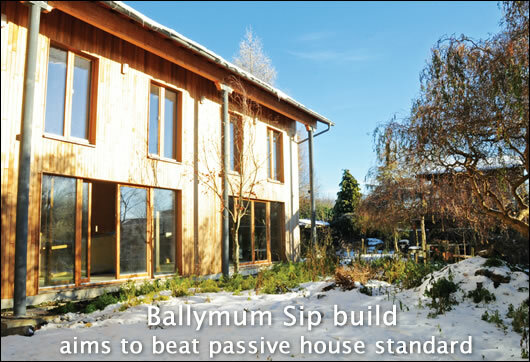 As buildings featured in recent issues of Construct Ireland have shown, there are many ways of building a passive house. Sustainable architect Simon McGuinness describes a project in north Dublin which is set to surpass the onerous standard using a different system – structural insulated panels (SIPs). In 2006, I was recommended to a client seeking an extension to a 19th century artisan cottage on a suburban plot in Ballymun, Dublin by the client’s business partner. On my first visit I was struck by the elevated site’s solar potential, and the failure of the existing building to exploit views of the mature gardens (with the Dublin mountains on the horizon) or the available southerly aspect. I presented a speculative design option — uncalled for in the brief — involving demolition of the existing dwelling and its replacement with a new house that would maximise the solar potential of the site and bring the garden into view from all the main rooms. After taking one look at the sketches for the replacement option there was no turning back — the client was converted. The fact I was proposing the passive house standard was not necessarily the first priority. This fits with my approach to passive house design — there should be no compromise on design quality or the client's accommodation requirements. 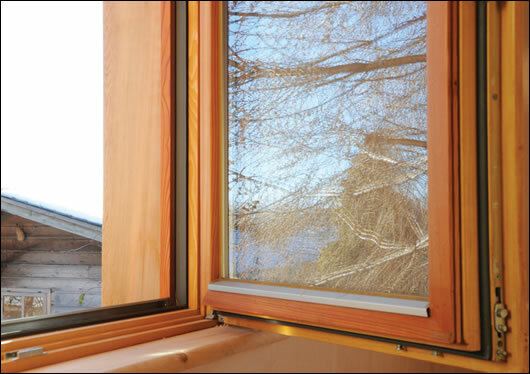 The Passive House Planning Package (PHPP) — the software used to design passive buildings — is flexible enough to accommodate an unlimited variety of features, house types and sizes. Just as well, as Dublin City Council had some very definite planning requirements for the site, and views into neighbouring properties were a particular concern on the asymmetric plot. The new house is a modern 300m2 detached two-storey, five-bed dwelling with double-height entrance hall/conservatory contained within an obtuse L-shaped plan form. A formal drawing room on one side of the entrance hall is complemented by the large open plan kitchen, dining and family spaces on the other side, all of which open directly to the south facing garden with large areas of south facing glass. The entire ground floor can be opened into a single space with the use of large pivot doors. Upstairs, the bedrooms feature vaulted roofs and exposed gluelam beams. These are accessed off a corridor that runs along the north elevation and cranks to form a bridge over the entrance hall and into the master suite. Essentially one room deep, the garden elevations of the house are extensively glazed and cedar clad, while the road-facing north and east elevations have small windows and are clad in brick and self-coloured rendered masonry to respect the existing streetscape and comply with planning conditions. Only the exposed steel corner column gives any hint that this is far from traditional masonry construction. The entire assembly is unified by a simple pitched zinc roof with very large overhangs to the south elevation. While researching suitable building methods for this project, I studied Kingspan’s Lighthouse project in great depth. This is a Code for Sustainable Homes level six, net zero carbon house built at the Building Research Establishment’s Innovation Park in Watford. I met the designer of the Lighthouse, Kingspan’s Jonathon Jennings (ed. – now Dimplex Renewables’ commercial manager), to review the Sub-10 design and test the suitability of the Lighthouse system for my Ballymun project. His response was positive. Jennings is regarded as an authority on low energy construction and his input at the early stages of the project was invaluable. What impressed me most about the Lighthouse was the structural insulated panel (Sip) TEK building system it was constructed with. The Kingspan TEK system used had extremely high levels of thermal insulation and achieved U-values of 0.11 W/m2K and an airtightness level of 1 m3/hr/m2. I was also impressed that the TEK system did not require a vapour control layer as the panel is inherently airtight. I was concerned about the possibility of someone accidentally puncturing an airtight membrane either during construction, or post-construction, while installing furniture or making minor modifications. At super-insulation levels, any puncture could cause interstitial condensation to form creating conditions supportive of mould growth. Not only did the TEK system not require an airtight membrane, it has proved itself capable of sustaining superficial damage without leaking air. TEK is also inherently less susceptible to movement due to shrinkage, another way that airtight seals can become over-stressed and fail after completion. The choice of a Sip system also simplified the build, allowed for strict demarcation of responsibility for achieving the building's airtight seal and reduced costs. While not a requirement of the passive house standard, low embodied energy materials were used throughout the construction. We saved over 40 tons of carbon just by replacing half of the portland cement in the raft foundation with Ecocem, a cement product from steel industry waste. The focus on green materials also informed the decision to use a timber frame rather than concrete construction. The TEK panel itself is made from 15mm OSB board produced from compressed forestry thinnings, and so is effectively a forestry waste product. The relatively thin TEK wall panel also lowers the building’s carbon footprint by reducing the number of trucks required to deliver the house to site. Having previously worked with Friends of the Earth on their Good Wood Guide, I specified cedar, oak and pine temperate timbers from Forestry Stewardship Council approved sources throughout the build. The zinc roof and rainwater goods are a low embodied energy roofing solution and 100% recyclable at end of life. The zinc standing seams also provide a convenient means to attach a future solar photovoltaic array using standard stainless clamps. Provision has been made for battery storage in the attic to support up to 70m2 of future PV panels, more than enough to achieve net energy positive status. This carbon focus extended to not specifying aluminium external cladding of window sections because of the avoidable embodied carbon associated with the production of aluminium. By specifying a wood pellet stove, the back-up heating (after passive solar gains) will be from 100% renewable sources native to Ireland. Surplus heated air in the large volume open plan family room will be distributed throughout the house by the heat recovery ventilation system. u The pellet boiler will be linked to a highly insulated 750 litre hot water cylinder (HWC) on the upper floor, which in turn will also be heated by 7.5m2 of evacuated tube solar panels on the roof. A heat exchanger in the fresh air duct of the heat recovery ventilation system will be supplied with hot water from the HWC, meaning solar-heated water will effectively be used to top-up the temperature of the fresh air supply, reducing space heating costs and extending the solar-only heating season. Sometimes I think that the HWC should have a Duracell wrapper on it – it looks and acts like a monster battery smoothing out energy demand and storing solar energy surplus. It allows us to compensate for the variability of solar availability and considerably improves the PHPP rating by allowing for reduced use of secondary heating from the wood pellet stove. The result of these design decisions is that the house will have zero carbon emissions for both hot water and space heating, and this is achieved without any micro-generation. Net energy positive is easily achievable for all new buildings. A small change to current government subsidies could produce a significant reduction in Ireland’s imported fossil fuel use. Subsidising the installation of solar panels on poorly insulated buildings is actually counterproductive. Once we achieve passive (or better) standards of construction, renewables can easily supply all our domestic energy needs. That is the holy grail of sustainability. I believe that heat recovery from wastewater is the next big step towards improving yet further the energy performance of dwellings. In a passive house, more energy is used for heating water than for space heating, so it makes sense to recover some of the heat lost in wastewater. We are investigating relatively simple systems which can recover this waste heat without the use of pumps or motors, and we look forward to including it in future passive house designs. James Maloney, contracts manager for ODS Construction, maintains that the Sub-10 house was the easiest build he and his team have ever worked on. “As much of the work was u done off-site, we were dealing with a dry site,” he said. “We were also able to retain a number of very old trees in the garden. Before work commenced on-site we sent many of the build team on SEAI and MosArt courses on airtightness and passive house building. The erection of the TEK frame system took three weeks and the complete build would have taken less than six months had the credit crunch not intervened and slowed things down. The Sub-10 passive house has been assessed to have a specific space heat demand of just under 10 kWh/m2/yr — well inside the 15kWh/m2/yr standard required for passive house certification. Its primary energy demand for space heating and electricity is assessed as 82 kWh/m2/a, significantly better than the 120 kWh/m2/yr passive standard. 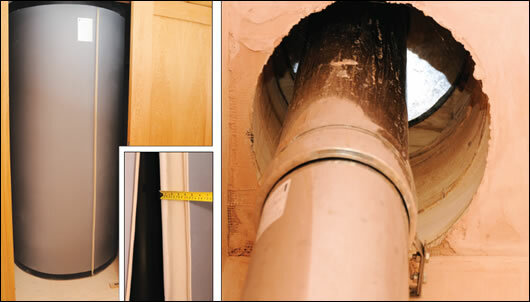 Pending completion of the HRV system, a final airtightness test has yet to be undertaken. Interim tests carried out on completion of the TEK frame achieved 0.67 air changes per hour (ACH) before any internal dry-lining or plastering was done, so we're confident of exceeding the required standard of 0.6 ACH. MosArt — who are accredited to certify buildings meet the passive house standard — will supervise the final test. 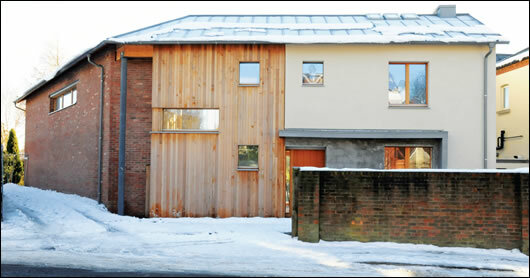 MosArt co-founder Tomás O’Leary acted as passive house consultant on the Sub-10 house. We have calculated that the house will have an annual energy bill of only €399 and maintain a constant year-round temperature of at least 20C in all rooms. To put that in context, the average Irish 120m2 semi, if built to this standard, would cost less than €160 per year to heat. By choosing to build new rather than renovate, my clients will soon be able to enjoy living in a much healthier building full of sunlight and attractive views. They have also future-proofed their energy costs and, in the context of climate change and peak oil, made themselves less exposed to external risk factors. If planned correctly, the cost of passive house construction in Ireland should be no more than an equivalent house built to current building regulations. The problem is that so few of our houses actually meet the current standards that, in reality, we are not comparing like with like. There is no fudging the compliance issue with passive house. In retrospect, the ‘drawing board’ was where most energy and cost savings were made in this passive house design — not on the building site. Passive cannot be easily applied to an existing design, but it is easily achieved in Ireland if designed in from the start. 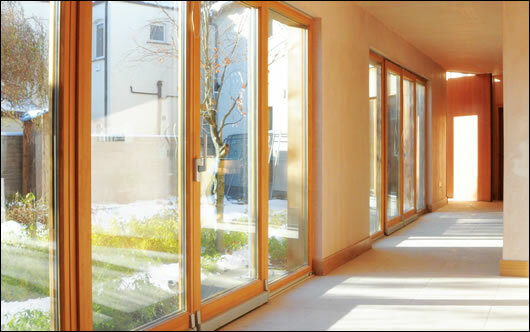 The Irish climate is particularly suited to passive house design with its mild winters, cool summers and good year-round solar profile. When I see the lengths to which my European colleagues have to go to meet the passive house standard, I can’t help thinking that we have an unfair advantage. Ireland is probably the cheapest place in Europe to achieve passive house compliance. 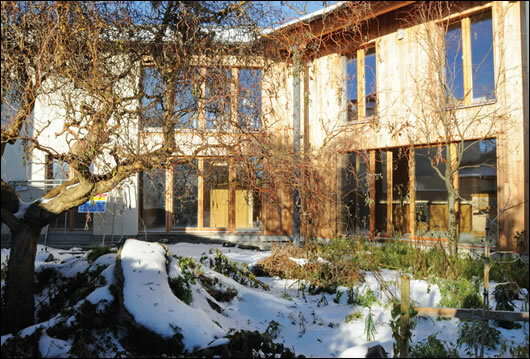 We should now just adopt passive house as our national building standard, steal a march on developing innovative next generation passive house technology and create the sustainable, export-led green jobs that would inevitably follow such a move.